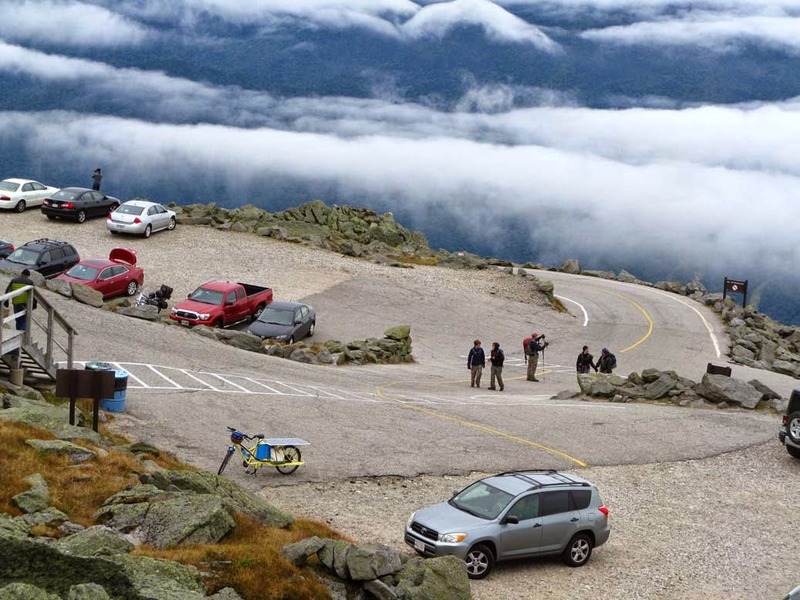 The ALT Energy Summit (http://altenergysummit.org/) alternative vehicle climb at Mt Washington was held on September 13/14. 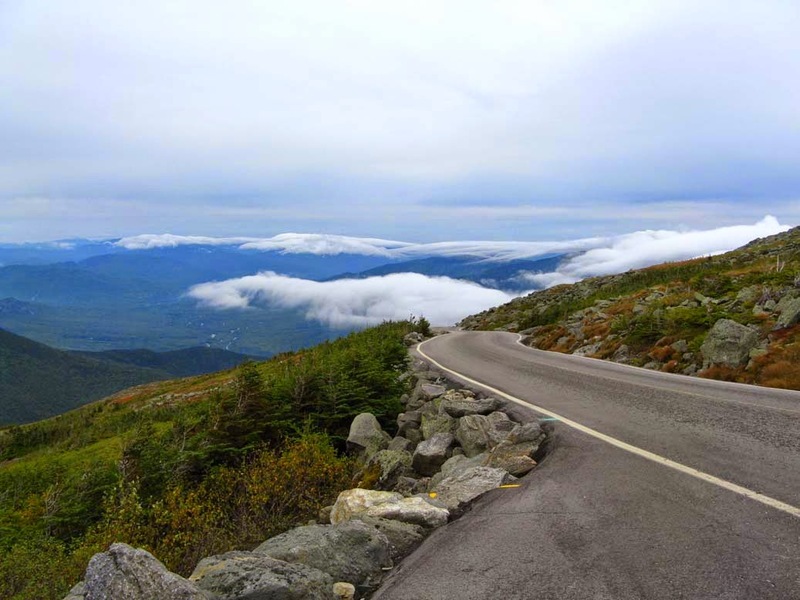 The mountain road starts at 1565' elevation, runs 7.847 miles up to about 6200' at the parking lot (the summit is 6288'), and has historically been used as a test of vehicles- the first motor vehicle to go up was a steam powered Stanley Locomobile in 1899. 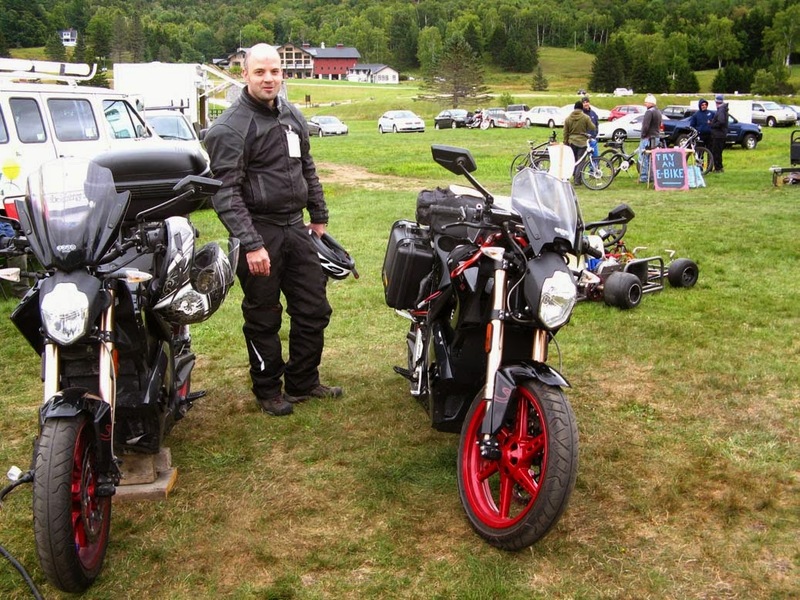 After a lapse of the event for several years, Ted Dillard, (President of the Boston Chapter of the Electric Auto Association), wanted an excuse to run his electric motorcycle up the road and revived it. 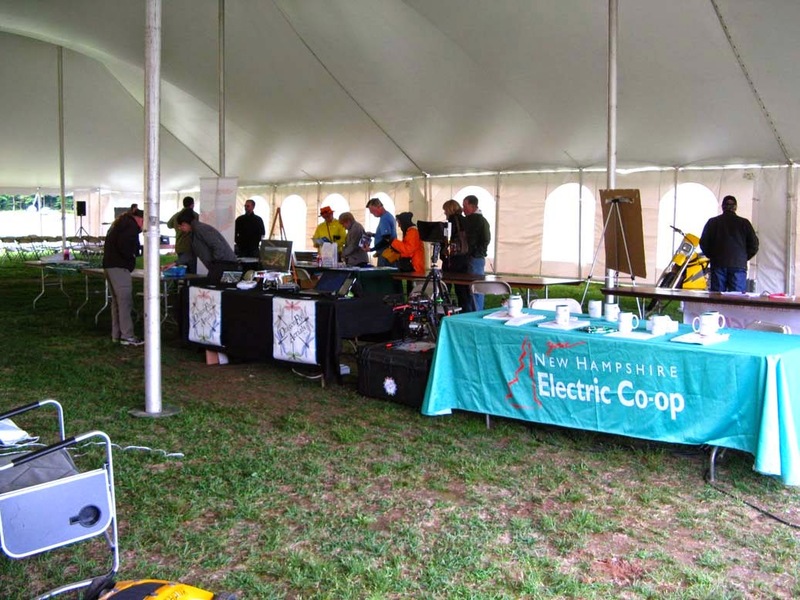 He secured sponsorship from the local utility- NH Electric Coop- and organized a Summit last year. 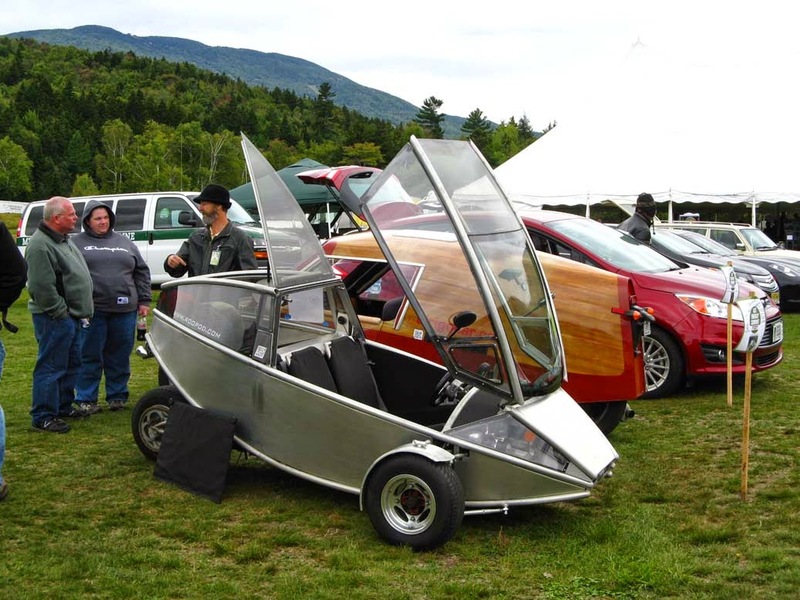 I had debated whether to attend, and later regretted not going because Michael Corbin brought his Sparrow electric auto. Michael had lived two houses up from me when I was a teenager in 1970's Connecticut, and made Corbin Gentry motorcycle saddles in the old mill in town. He also had an orange fiberglass bodied Phaeton with a VW motor, and at the time I had just started to put Porsche 356 motors into a VW bug and a Karmann Ghia, so it would have been nice to finally connect. Unfortunately he didn't attend this year, but it's interesting that we have both moved towards electric. 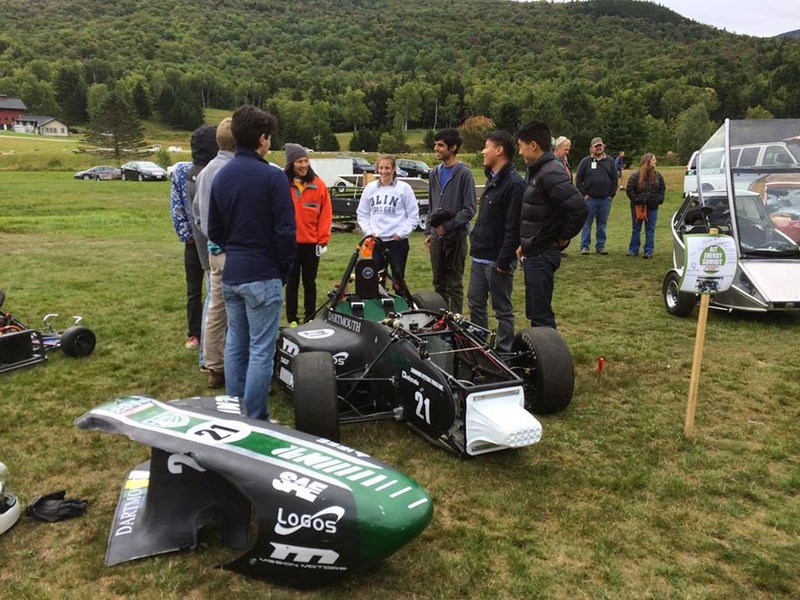 Since Ted had graciously taken part in the Upper Valley Electric Vehicle Forum and Demo last May, it gave me a push to attend the Summit this year. 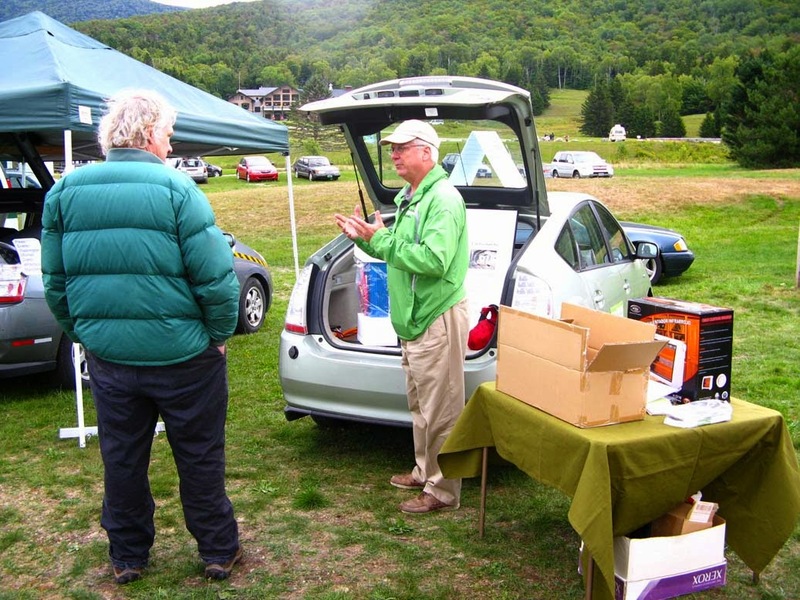 I also wanted to display Sierra Club information because of their sponsorship (along with Plug in America and the Electric Auto Association) of National EV Week (https://driveelectricweek.org/). 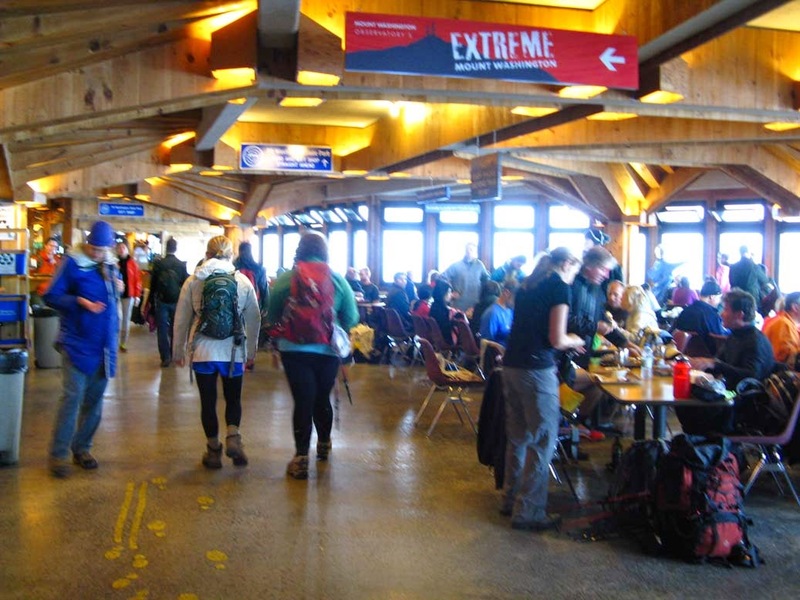 Although I would be out riding the Longtail up the mountain, Dolores Rebolledo of the NH Department of Environmental Services had a table next to mine, and was able to answer questions. Inside the base tent- my Upper Valley Sierra Club display was on the far table. the vehicles were moved inside around the edges of the tent. 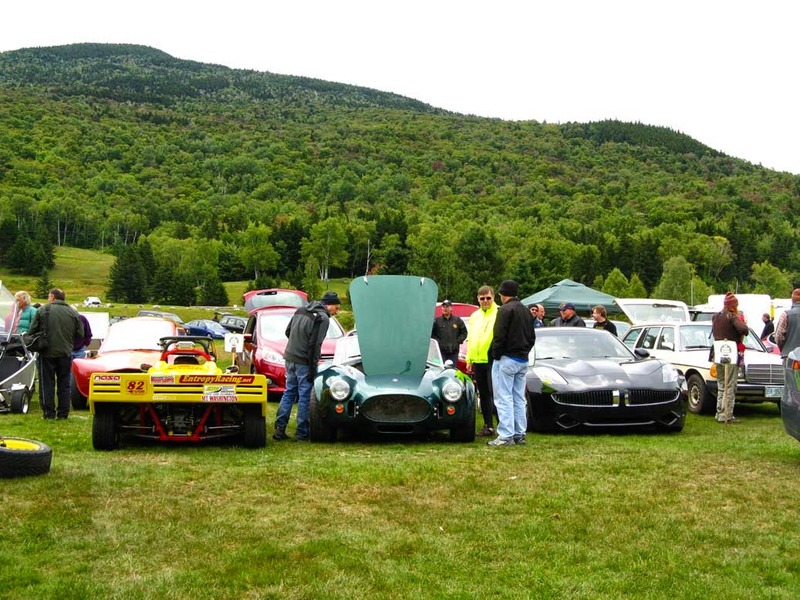 an electric Cobra, a Fiskar Karma, and a Mercedes converted to a grease wagon. motor controller. I'm not sure why a main contactor is mounted on the steering though. and also upgraded chargers to make long distance travel more feasible. with software that lists the details of charging stations along the way. and then a Ford Fusion Energi. These are internal combustion engine cars. Bikes included two Outriders, as well as eVelos, and a RANS recumbent. Heat management is an important consideration when pushing design limits. I did a dozen runs up a 12% slope, 1.25 mile long hill near my house with an infrared thermometer in hand to prepare for the Summit. On one sunny day the controller peaked out around 119 degrees F- hotter than I like but within limits. (I use the "too hot to touch is too hot" rule for electronics.) I then modified the Longtail by adding a sheet metal bracket that moved the controller out into the air flow. One of the Outriders pictured above had it's motor overheat at mile 3, and unlike my Longtail they didn't have the option of getting off and walking alongside, so rather than burn it out the owner decided to coast back down. 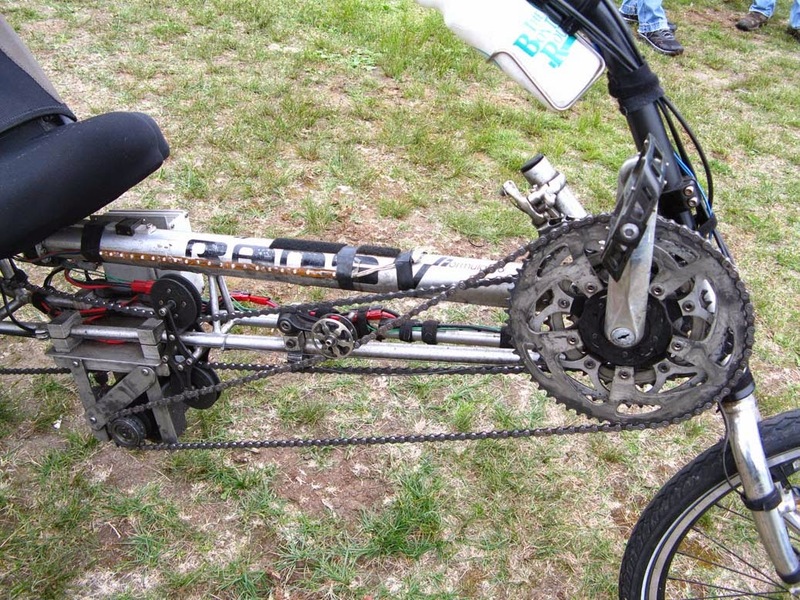 (The trikes that climbed Pike's Peak had custom cooling fans.) I'm trying to decide how to cool the mid motor on the third bike, because long before the electrical insulation catches on fire the permanent magnets start to degrade. At the moment I'm thinking of a small fan on the outboard end of the shaft (away from the drive sprockets), with small holes in the motor casing for air flow. If moisture turns out to be a problem, the holes could be sealed, and then the motor would become a regular TEFC (Totally Enclosed Fan Cooled) frame style. An advantage of a hub motor over an RC (Radio Controlled) type motor is the larger surface area, (most of the time only the frequency of magnetic transitions is considered). into a large fourth front sprocket riding on a crank freewheel. as an unskilled mechanic could easily mess this up. next display over was about weatherization and energy efficiency. Neither of these vehicles has a gearbox, but the extra mass of the Tesla accentuates the low rpm problem. For the third bike I'm planning on using the derailleur system to allow the motor to be shifted, and the question isn't so much the benefits of shifting down, but more of how long a shifting mechanism and chain will last at 700 watts. The EVSR car reaches the top in 7 minutes, 28 seconds, or around 60 mph. My time was 1hr 31min 31sec, which is OK- faster than walking, but since the record time for a bike is 49 minutes, there is definitely room for improvement. In all fairness it should be noted that that I was able to get off the bike at the top and walk around looking at the views like a normal tourist and then ride down, whereas I've been told by a person who has been a pit crew for a bike racer that their job was basically to scrape the racer up off the pavement at the end and ferry them back down. 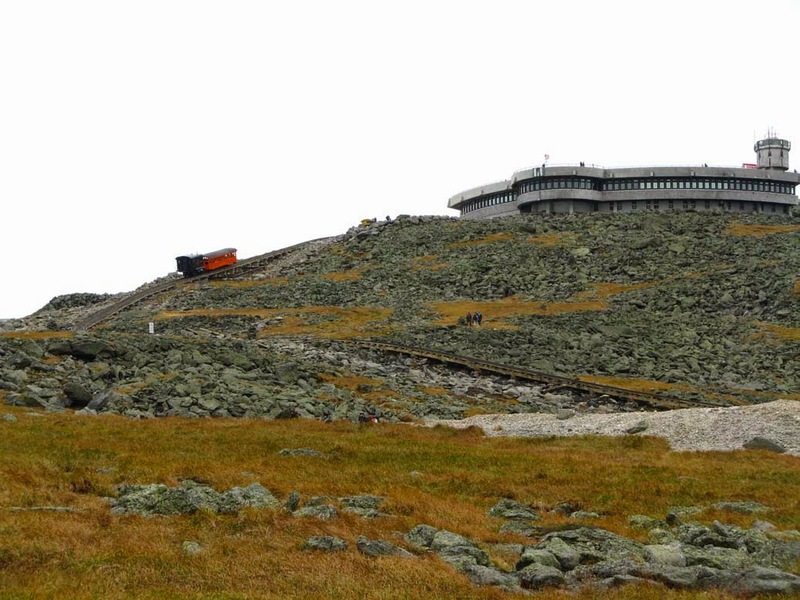 The summit building with a cog railway train approaching. on the photo you can see the infrared thermometer in the front basket. 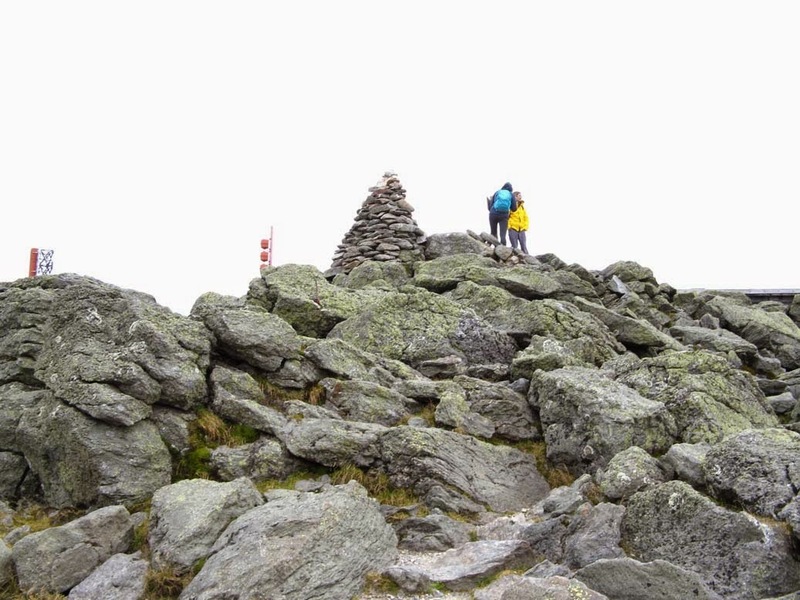 The cairn at the very top of the mountain (6288'), with people having their picture taken. is blurry because of the high indoor humidity condensing on my cold camera lens. The building is built for severe weather and has an extremely tight envelope. 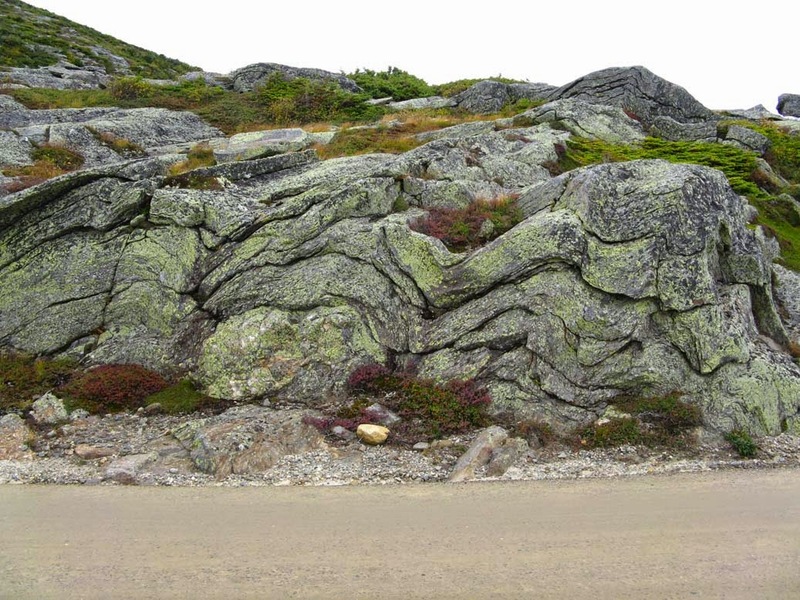 very much like ocean waves rolling over and around nearby mountains. Gazing down into the deep blue depths of the ocean. especially since Ted had asked us to be back for an exhibition period. It was just as well, because shortly after the weather turned to freezing rain. and I had a hard time standing on the edge and holding the camera steady. 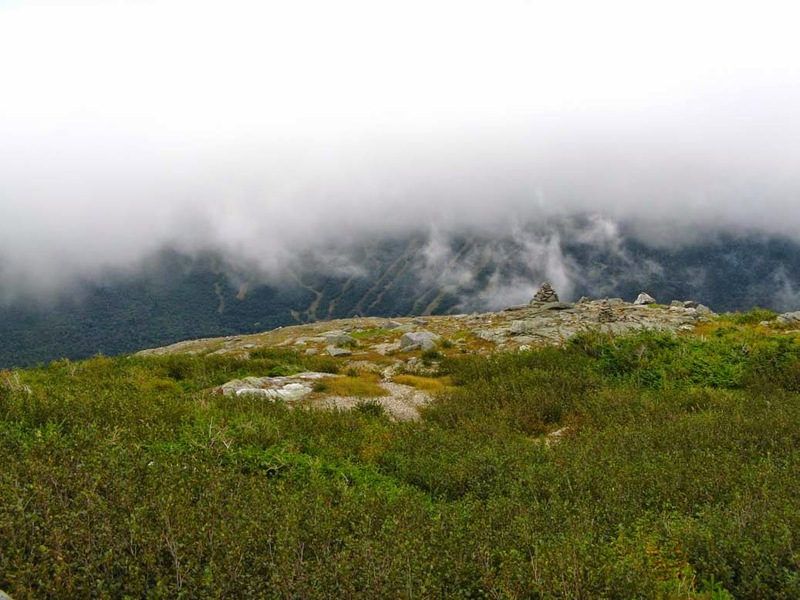 at a ski area under the clouds. The Longtail used 670.97 Wh of electricity on the way up, giving 86.4 Wh per mile, at an average speed of 5.14 mph. This is one of the worst fuel mileages I've seen, similar to the other end of my road. Coasting back down I turned on regeneration and had a pleasant, leisurely ride looking at the scenery. Regen put 151 Wh, or 22.5% of the energy back into the battery, reducing trip energy use to 35.2 Wh/m, however a second glitch in the electronics showed up. After a few minutes of regen around 320 watts (15-16 mph), it turned off, and after I slowed down it turned back on again. The controller was cold, so my best guess was that the battery voltage rose above the upper limit, and the Battery Management System (BMS) shut off. I rode the rest of the way down using the brakes occasionally to hold the speed down to 200 watts (10-12 mph), (and also pedaling on the more moderate declines to keep the regen up), and the regen stayed on, At this point I don't think regen is all that helpful on a bike. During the last summer it has usually returned only 0.5 to 4% on my longer trips, and the only large regeneration happens for short time periods down one or two hills on my routes. 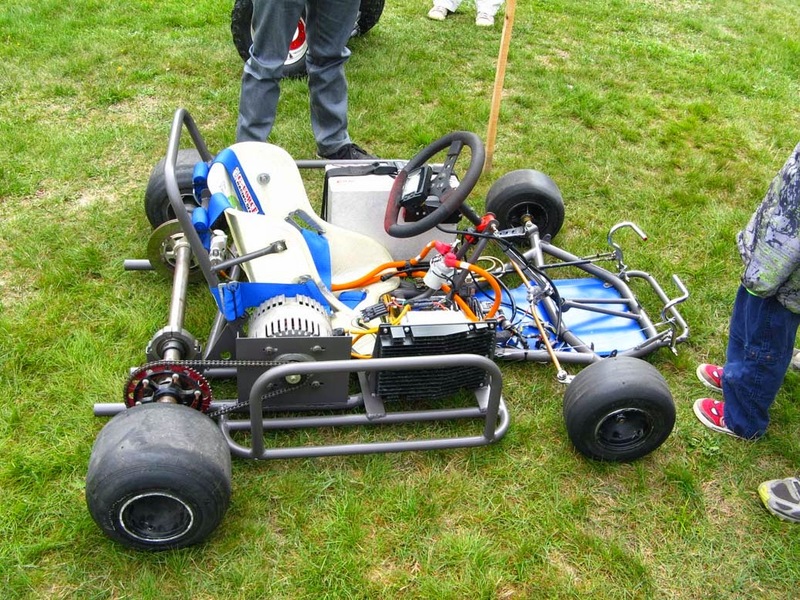 It's best use seems to be a substitute for braking, but even then I haven't used it much- if I am coasting 15-25 mph down a hill I prefer to stay at that speed and cover ground, I've mostly turned it on above 25 mph for only brief periods of time. The solar panels are usually several times more productive (20-40% generation of load). 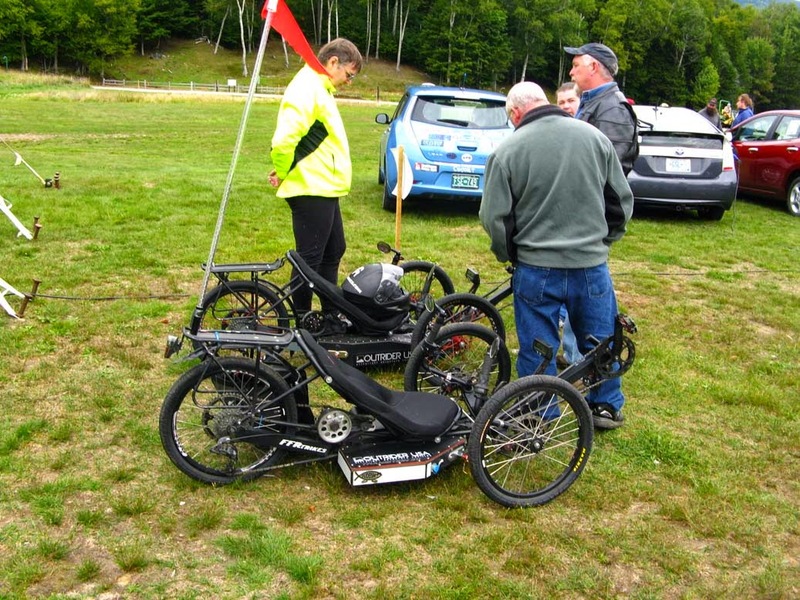 -John Anderson used 750 Wh on his RANS recumbent, at an average speed of 7.1 mph, (showing the advantage of using gearing to keep the motor rpm higher). 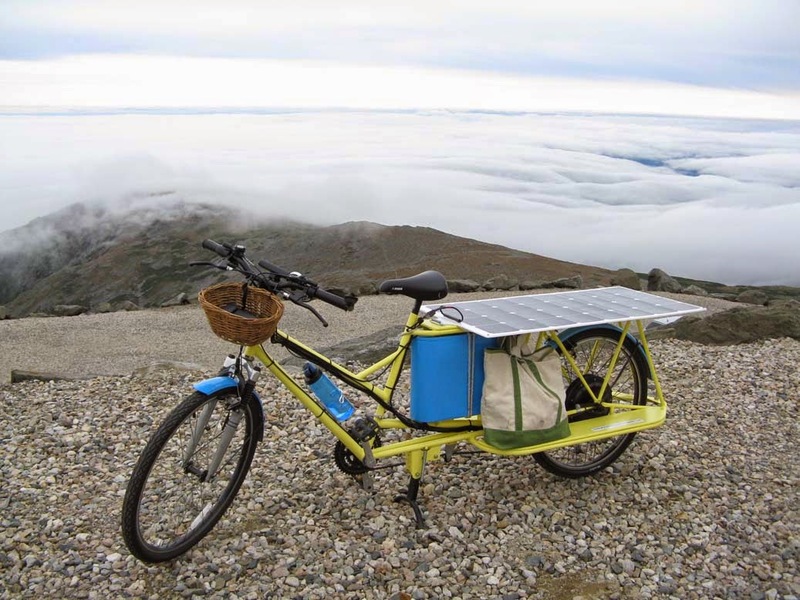 -Dr Bass commented that his 2012 Zero S, modified with a 2013 motor and ZF15 equivalent battery (13 kWh usable), with of total weight of 500 pounds, took 2071 Wh from start to the summit and got 800 Wh of regen on return. 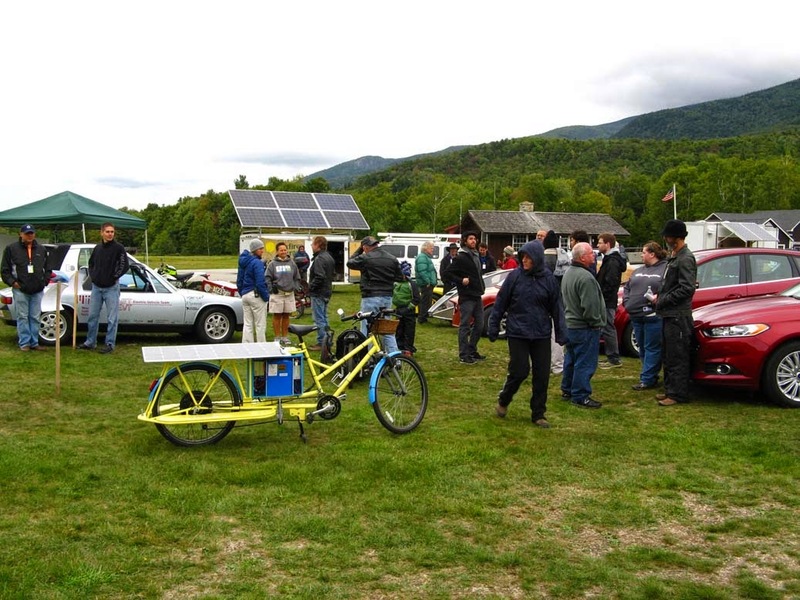 -Ted Dillard had estimated about 2 kWh usage for his homebuilt electric motorcycle. 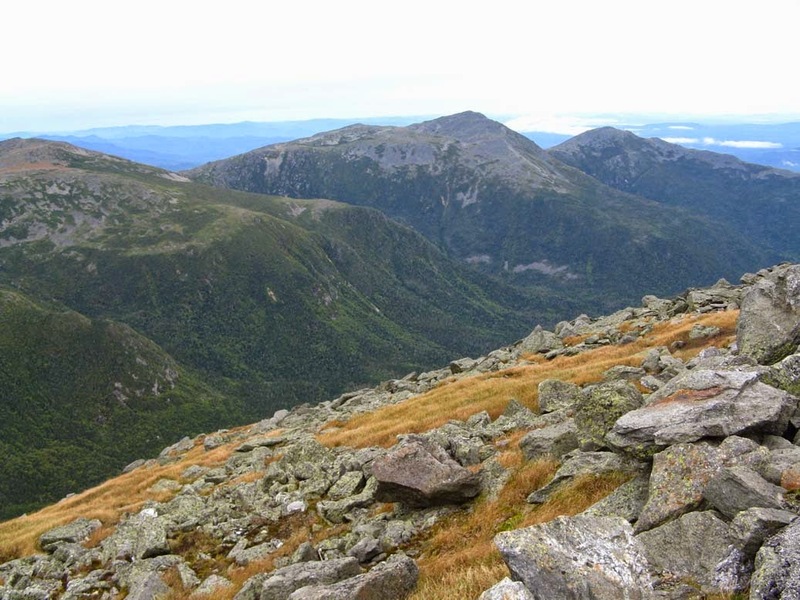 -Tim Letourneau commented that the Ford Fusion Energi regenerated about 6.92 kWh on the way back down from the summit, giving him a 91% charge on the battery. 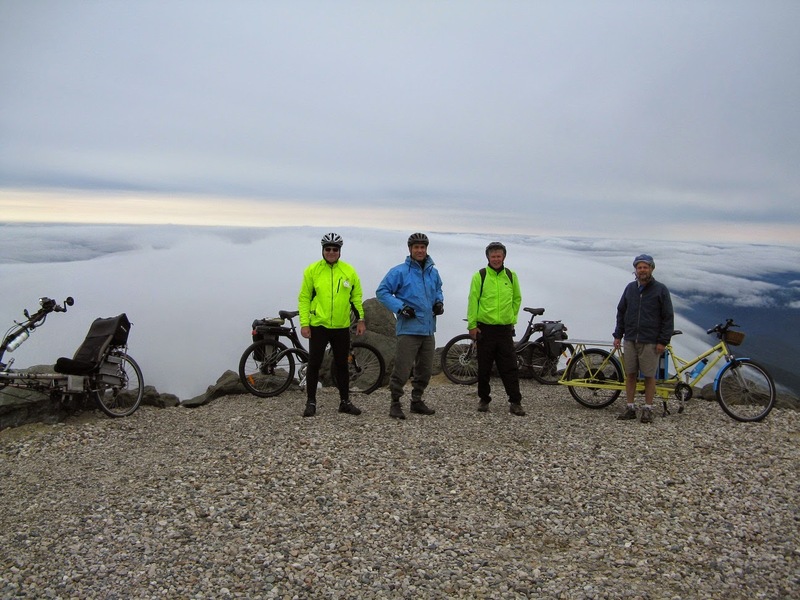 -I heard anecdotally that last year a Tesla had regenerated about 60-65% of the energy used during the climb. Besides getting a better feel for designing a cargo bike for both distance and hill climbing, there were two other rewards for the day. 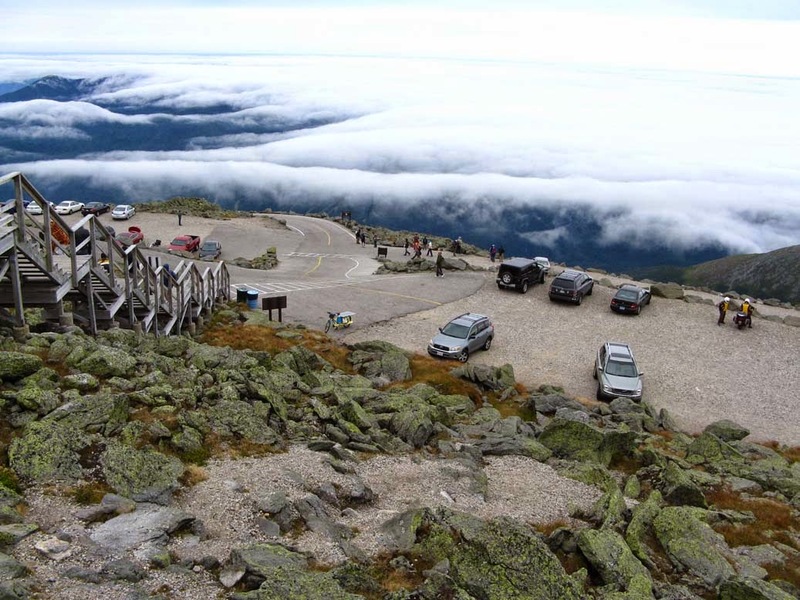 The first was that a picture of the Longtail got posted on the Tesla Motors Club forum: (http://www.teslamotorsclub.com/showthread.php/30898-2014-Mt-Washington-Trip/page4). 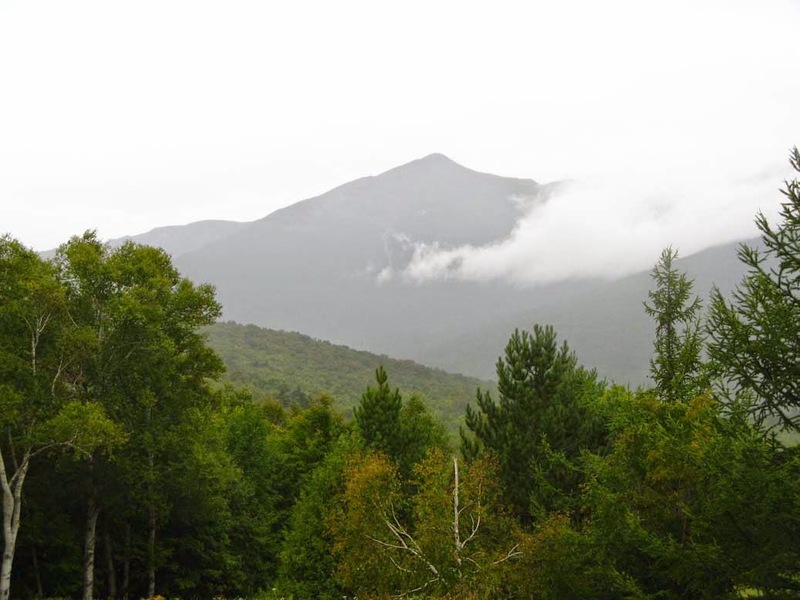 The second was that after pushing some limits climbing Mt Washington, the upper Connecticut river valley forests and hills were an indescribably beautiful trip home.